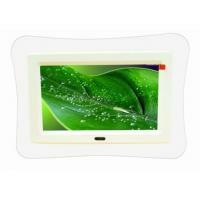 8" TFT LCD A+ panel, with 720*576 high resolution, wide visual angle, clear display and rich color, support 16:9 and 4:3. OTG Function,Can connect to computer as card reader. View individual pictures(JPEG)and slide shows with MP3 music on the background. Scrolls through your media card photos at user selected intervals. Automatic slide show with multiple transition effects. Directly insert a compatible memory card into the digital photo frame to show photos, play MP3 music and supported video files. Video and audio output jacks, display photos and slideshow on most televisions. AC power, no batteries required. Can work with SD/MMC/MS/XD(H Version), CF media card. Built-in 2 audio stereo speakers. User friendly on-screen display lets you access all controls easily.